Las Vegas, NV (January 5, 2017) – BLACK+DECKER™ announces its new line of robotic vacuums, the SMARTECH™ Robotic Vacuums. The new robotic vacuums connect to the BLACK+DECKER Mobile App via Bluetooth® Technology so homeowners can control the vacuum from their smartphone. 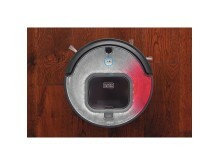 Within the app, users can select a cleaning mode, program a cleaning schedule, drive the vacuum to a specific location, and customize the color of the robot’s LED top to fit the owner’s style on two of the three models. With a long runtime, a large capacity dustbin, and a wide 9” cleaning path, homeowners can count on the SMARTECH™ Robotic Vacuum to get the job done. BLACK+DECKER has been pushing the limits in the home product space since it invented the Dustbuster®, the world’s first cordless handheld vacuum in 1979. The innovation continued in 2013 when the brand launched its long-lasting Lithium Ion cordless vacuums and in 2016 with the announcement of SMARTECH™ vacuums with sensing features. Adding to the existing SMARTECH™ sensing features, the new SMARTECH™ Robotic Vacuums now feature AlertSense™, which alerts the user when the vacuum encounters an issue. 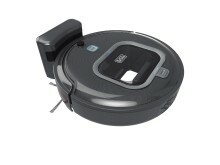 By expanding into the robotic vacuum space, BLACK+DECKER continues this legacy of advancing vacuum technology. Users can start the SMARTECH™ Robotic Vacuums from within the app or by simply pressing a button on top of the unit. When the vacuum starts cleaning, it uses AutoSense™ technology to determine whether it’s cleaning hard surface floors or carpet and automatically adjusts its power level accordingly. 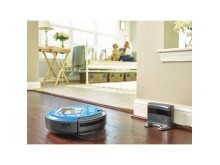 As the vacuum runs, its low-profile design captures hard-to-reach debris under furniture and its two side sweepers clean along edges and in corners. The SMARTECH™ Robotic Vacuum also uses sensors to detect stairs and other drop-off areas. If the vacuum does encounter an issue, the AlertSense™ feature prompts an LED light on the top cover to flash directly on the problem area, eliminating guesswork. The new BLACK+DECKER robotic vacuums feature a 9” extra wide brush roll to clean more area per pass compared to the leading robotic vacuum on the market and a clear one liter-sized dustbin to hold more dirt and debris for optimized runtime and cleaning performance. In fact, the debris collects itself into a compacted disc form to make removal quick. Furthermore, its high-performance HEPA-certified filter captures 99.9% of pet dander and dust particles (.3 microns and greater) to reduce allergens and irritants in the home. The BLACK+DECKER Mobile App links with the SMARTECH™ Robotic Vacuums to provide a variety of functions including three cleaning modes – Auto, Quick, and Spot Clean. The Mobile App also connects to the vacuum for manual driving and gives the user the ability to direct the path of the robot while it cleans. Within the Mobile App, homeowners can monitor the robotic vacuum’s battery status and send the vacuum back to its dock for charging at the touch of a button. On all models, fun personalization features in the Mobile App include the ability to name the robotic vacuum. On two of the three models, users can also choose the color of the vacuum’s prismatic color-changing LED cover. Once the vacuum needs to recharge, it automatically returns to its dock to prepare for its next job. 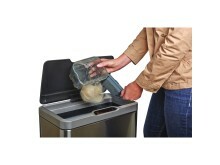 With a large, clear dustbin, homeowners can easily see when it is full and then remove the bin with the push of a button. In two out of the three available models, the vacuum’s brush roll uses anti-tangle bristles to capture stubborn pet hair and can be snapped in and out of the unit without the need for tools. Keeping Up Just Got Easier™ with the BLACK+DECKER SMARTECH™ Robotic Vacuum. Available in late March 2017 at retailers nationwide, the range of robotic vacuums will retail for $349 - $399 MSRP and come with a one year limited warranty. The BLACK+DECKER Mobile App is available for free download on iOS and Android® devices on the Apple® App Store and the Google® Play Store. Stay tuned in 2017 as BLACK+DECKER continues to advance the home product space. Bluetooth® is a registered trademark owned by Bluetooth SIG, Inc.
Apple® is a registered trademark owned by Apple, Inc.
Android® and Google® are registered trademarks owned by Google, Inc. Prior to publication, it must be approved by BLACK+DECKER NORTH AMERICA.